The display stands by Geprom Design were chosen to set up the Audika headquarters present throughout the national territory. Audika is an international group specialising in solutions for hearing (hearing aids, accessories for hearing and hearing protection). 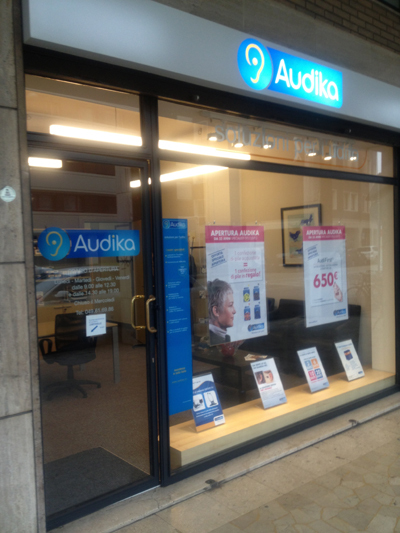 Founded in 1976, Audika is the number 1 in hearing correction with over 450 Centers all over France. Since 2007 also in Italy, Audika is in constant growth. With more than 110 centres and service points in Italy, it is it now a point of reference for the Italian market. To set up the shop windows of Audika headquarters, the display stands DDP and WH-Display made of transparent Plexiglas® were used. DDP is a display stand for notices, suitable for single sheets and perfect for a quick message change. The particular constructional system makes them very versatile because they can be used both horizontally and vertically. WH-Display is a display designed for quick message change composed of a flat pocket in shockproof transparent Plexiglas®, held up by connections, fixing clamps and wires/rods for suspension. The display stands are made with top quality materials like shockproof transparent Plexiglas® Röhm original, with 30 years guarantee against yellowing. Actually, for the constructive mode and for the special materials used, the display solutions by Geprom are performing even in conditions of considerable environmental stress, such as sudden change of temperature, UV radiation and wear and are the perfect equipment to be placed in a shop window. After the elegant shop at Siena, Geprom Design supplied the display stands for the new shop Acqua dell’Elba at Florence, prestigious brand of craft fragrances, created and produced on Elba. Geprom for Autoguidovie: the display stands for sustainable mobility.